I’m not opposed to it but if I’m ever given the choice between adding cheese to something or skipping it completely I always do the latter. Those pizza commercials where the happy person, usually laughing, is picking up a slice of pizza and the long slimy, melted cheese refuses to cleanly break bonds from the mother pizzaship? I turn my head away in disgust. Grated cheese of any kind over my fresh green salad? No thank you. It used to be as simple as refusing to add pressed slabs of curd to a cracker but now that cracker comes with cheese “flavor” imbedded into it while it was becoming a cracker. So now? It’s no longer cheese and crackers. Rather, its cheese and cheese crackers. When I was younger I once asked a priest if there was any chance that the Bible’s story of Adam and Eve’s downfall in the garden of Eden wasn’t caused by a bite of a naturally grown (and healthy) apple but in fact a piece of errant cheese? Cheese is added to virtually everything edible: Chili?,Hamburgers? Eggs? Sandwiches? Pasta? Bread? Chips? There are fewer food items where cheese hasn’t been attempted to be added than not. Here’s the thing I’ve suddenly realized: Obsessions can be a good thing. Whether it’s an unusual distaste for something so much that I watch everything I eat or just the reverse: Adding cheese willy nilly like a crazed cheese lunatic. It can work in your favor greatly if you allow it too ahem, fully blossom. Its like obsessively watering in the garden. 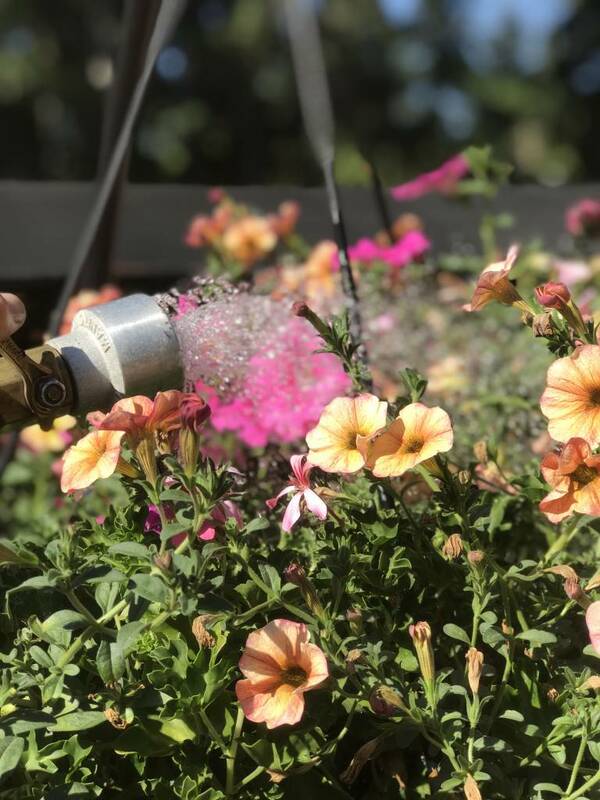 During these hot summer months especially concerning pots, containers of all sizes ,and hanging baskets over watering just isn’t possible. I’ve seen thousands upon thousands of plant issues and in but a handful was overwatering the issue. Let me parse my words here though. Over watering is usually associated with houseplants. Because of the relatively dark conditions indoors combined with the generally tropical nature of houseplants it is possible to drown a plant. (I usually describe watering houseplants in terms of “sips” and “drinks”. Some folks have opted to create beautiful baskets with all kinds of succulents. Obsessively watering those on a daily basis will only improve the growth (and thus the looks) of your baskets. Succulents (sedums, sempervivums, agaves, echeverias) have a capacity to go dry in- between waterings but if they receive too infrequent moisture you’ll notice that stress on those plants aren’t pretty. So water those regularly too. “Watering regularly” by the way means if at all possible, water the same time each day. (It’s really your personal preference of morning or evenings) Are there advantages of any particular time of day? Not as many advantages that being regular each day will produce. A busy beginner gardener once asked me what was the least amount of effort she could do that would yield for her, the biggest result. “Become obsessive about watering.” was my answer. Whether or not she liked cheese was beside the point.